Safety Managers are the catalysts of CORE’s Safe Assist Services. They are responsible for implementing and monitoring safety and health programs, which ensures that each of our clients’ businesses perform to reduce risk on job sites every day. But beyond a job description, what makes a truly great safety manager? And how can employees aspiring to develop into these roles stand out? We asked our Directors of Safety Services, Jorge Torres and Scott Lydick, what attributes they desired in top-notch safety managers. Together, they came up with these five qualities. The risk of hiring a “cop” is often the primary concern of employers who are looking for a new safety manager. A good safety manager should coach and mentor employees and leaders to create a safe and trusting work environment. Not to say that disciplinary action is off of the table, but great safety managers focus first on using influence to create change, not exerting rigid authority. “You can teach someone safety, but you can’t teach someone how to be a ‘people person,’” says Jorge. Great safety managers are able to relate and connect with employees to build relationships of mutual trust. Showing some personality and engaging employees can go a long way in building rapport with coworkers. Though the balance of respect should always be maintained, being well-liked is a huge asset in a safety manager. 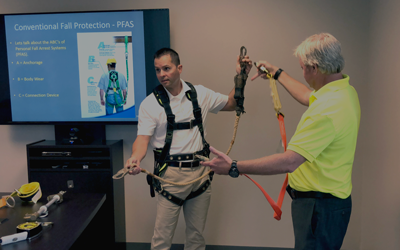 Safety managers should be the most knowledgeable members of the team when it comes to potential safety risks, hazards and requirements, but that doesn’t mean they should immediately start spouting off rules to employees. “Each client is different, and safety managers should prioritize the client’s goals and needs above what they think they know. Asking questions to find solutions is extremely valuable for a top-notch safety manager,” says Scott. “Let’s be candid— wearing an un-tucked, wrinkled polo as you lead a new team in safety training isn’t going to win you any credibility points,” says Jorge. Studies prove that appearance has a direct correlation to people’s assumptions of you—and your knowledge. A great safety manager dresses and speaks appropriately to gain respect and trustworthiness. If appearance is the easiest quality to address, patience may be the most difficult. “I often hear safety managers who are completely frustrated when their ideas aren’t immediately accepted by a new client,”says Jorge. Pushing expectations too hard and too quickly can create resistance that will only further delay a safety manager’s desired results. These five qualities are excellent in any role, and anyone with a strong drive to serve others and improve safety in the workplace is sure to exceed expectations. In need of a good safety manager, let us help. Click here to learn more.